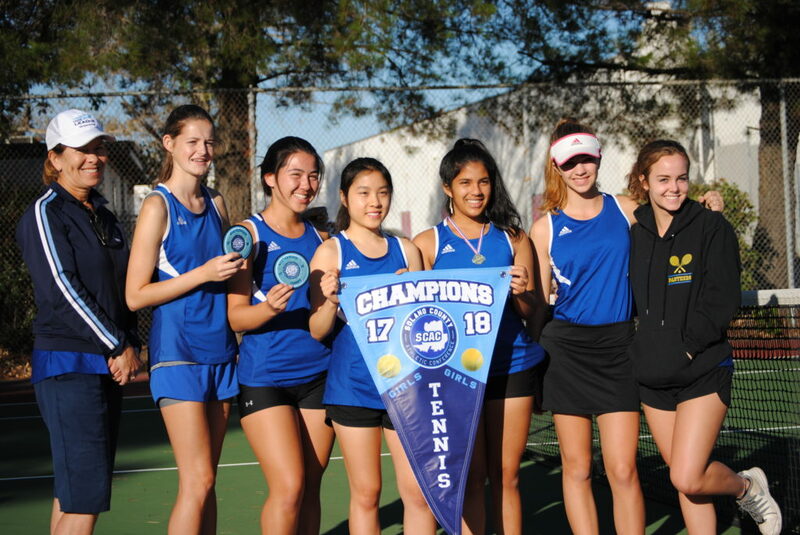 At the Solano County Athletic Conference (SCAC) tennis tournament this week in Fairfield, the Benicia High School Girls tennis team finished their season with a 73-0 consecutive wins — a new record for both boys and girls SCAC tennis! Below is a list of wins and accolades received by the players and their Coach Lisa Burton. #6 – Head Coach Lisa Burton accepted the SCAC League Champions Pennant, for the team taking first place in the league standings. Ended this season with an 11-0 record, as the league canceled the remaining 4 matches due to the Napa fires. This is the team’s 5th pennant in a row! See attached photo. Onto the CIF Sac – Joaquin Section Team Tournament next week, with a home match on Wednesday afternoon, November 1 against River Valley of Yuba City! Come out to cheer them on at 3pm! Was a great season for the team and coaches, congrats to all!! !